Presentation of the book "Reinventing the Company in the Digital Age"
The universe offers some of the most impressive and amazing shows. One of the most accessible examples are the northern lights, produced by energy particles from the Sun interacting with the Earth’s magnetic field and the upper atmosphere. However, this phenomenon has a dark side: the Sun, the source of life, could also be the source of a technological catastrophe of high economic cost. The study of our star and the monitoring of its behavior and how it interacts with our planet is vital. The climate has conditioned the history of different societies. An extreme case is illustrated by the famous series, Game of Thrones. At present it continues to have a direct effect on several highly important economic sectors, such as agriculture and livestock, solar or wind power generation and tourism. In Spain, the tourism industry is 11% of the GDP and provides 13% of employment, approximately. However, there are not so obvious consequences that could have dramatic consequences. This is due to our current technological dependence, especially on telecommunication and power supplies. The evolution of the Sun’s properties has conditioned the process of the appearance of life on the planet. At present, our star is in a more peaceful phase of its life, but even so, it has cycles of activity that last for 11 years. During these cycles, the energy we receive from our star varies less than 0.1%. These variations, together with ultraviolet streams, could have a certain effect on precipitations. In any case, the main cause of climate change is mankind. 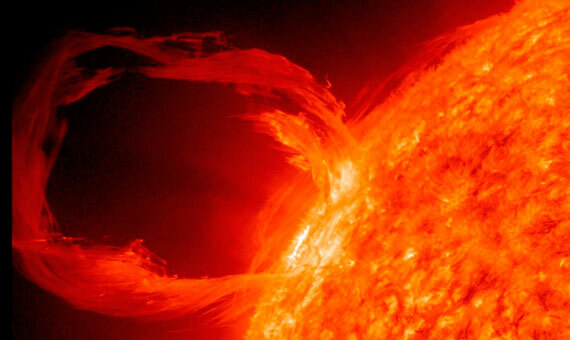 Other phenomena associated with the solar cycle are sunspots, prominence and coronal mass ejections (CME). The interaction of solar activity with our planet (when it reflects on Earth) produce an extraordinary spectacle: northern lights. This process is also visible in other bodies of the Solar System, leaving us perplexed by their beauty. But it’s not always so positive. The Sun abruptly emits radio waves, X-rays and very energetically charged particles , all of which are associated with the presence of intense magnetic fields. CMEs contain billions of tons of material which travel at speeds of millions of km/h. If the Earth stands in its way, the economic consequences can be considerable. The most extreme example of the interaction between solar activity and Earth, which fortunately occurred before our absolute dependence on electricity, happened in 1859. It is known as the Carrington event after the British astronomer who discovered it. Starting on August 28 of that year, a solar storm caused the appearance of lights, or auroras, in countries such as Colombia and Cuba. Telegraph networks in the United States and Europe, in an incipient development, suffered serious effects that even caused fires. Another more recent and not so dramatic event, although not isolated, occurred in Quebec in 1989, when a geomagnetic storm caused a 9 hour blackout. The same storm also caused the shutdown of a nuclear power plant in the US. During a solar storm in 2003, transformer failures occurred in South Africa and at a Swedish nuclear power plant. July 2012 saw the occurrence of an extremely active solar storm, although fortunately the CME heded in the opposite direction to our planet. Some studies predict that the possibility of an event such as the one in 1859 occurring in the next 10 years is 12%. The economic losses, due to our technological dependence and our avid energy need, will then be very significant. Recent studies indicate that if an event similar to the Carrington event in 1859 occurred, transformers throughout the electrical network could be damaged. This phenomenon would lead to a general blackout and the consequences would have an extraordinary economic impact due to the time needed to make the repairs. It would also cause problems in communications and transportation. 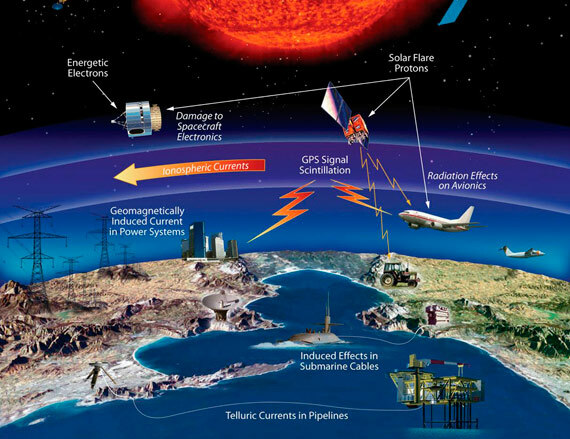 At present, commercial and research satellites, GPS (American) or Galileo (European) satellite systems, aircraft electronics, submarine cables, oil and gas pipelines and electricity supply networks are highly sensitive to extreme solar activity. 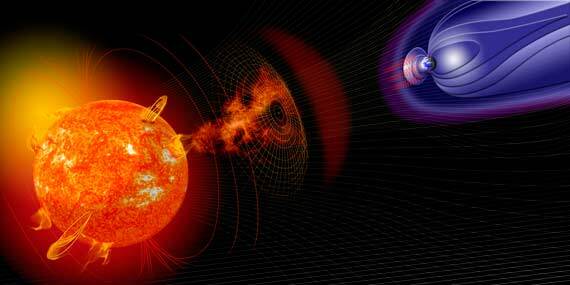 This sensitivity is due either to the direct flow of energy particles from the Sun or to the possible occurrence of geomagnetic induced currents It has been estimated that a CME that directly affects the US would have an economic cost that could exceed $ 40 billion every day and could affect 2/3 of the population. In the rest of the world, indirectly, it would be another $ 7 billion. Therefore, Sun monitoring policies are required, as we do with terrestrial meteorology, in order to predict the occurrence of such events and to develop prevention and mitigation policies. In Spain, preliminary studies have already been carried out on the effect on the electricity network, although the solution has to go through policies coordinated on a national level. 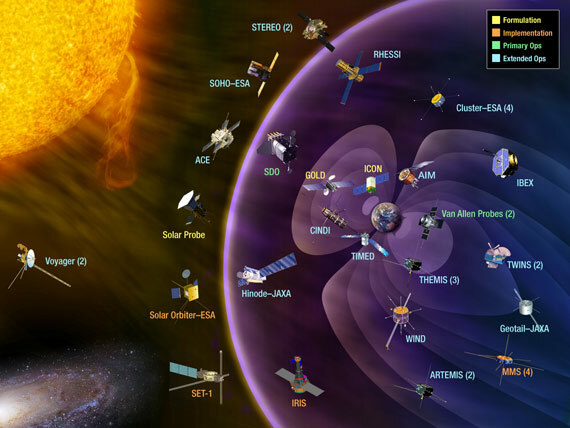 In fact, there is a fleet of ships in space (Proba-2, Proba-V and Swarm, together with the joint mission between ESA and NASA SOHO solar observatory) which are continuously observing the Sun, lead by NASA and the National Oceanic and Atmospheric Administration (NOAA), and a terrestrial network that complements it. In Spain, there are also solar telescopes in the Teide and Roque de los Muchachos observatories, both in the Canary Islands. The European Space Agency (ESA) is in the midst of developing a its alert system called “Space Weather Service Network”, located in the “Space Weather Coordination Centre”. The ESA is preparing a mission for 2023 which will be able to predict an impact of a CME several days in advance, making it possible top prepare the most sensible systems, such as the electricity distribution networks. The ESA is studying the idea of sending it to an equidistant point between the Earth and the Sun, called Lagrange L5 point, so that the three would form an equilateral triangle and the satellite directly will see part of the surface of our star that, due to solar rotation, is still not visible from our planet. Nevertheless, the attitude of the new Trump administration, which is sceptical about climate change and in principle not very sensitive to medium and long term planning, does not suggest continuity in investing in research. Although the European Space Agency has its own climate monitoring program called Copernicus, European space policies are still somewhat timid and lack ambition. Maybe it’s time for Europeans to take the reins of our astrological destiny by maintaining international collaboration, in this as in other industries.